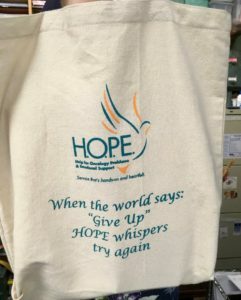 Merchandise for sale at H.O.P.E. 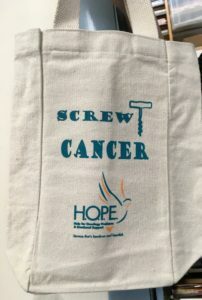 t-shirts, sweatshirts, wine tote bags. please call the office 717-227-2824. Has a divider to carry two bottles of wine! 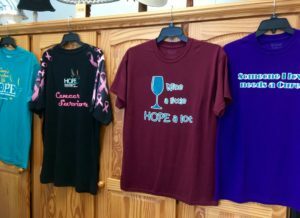 New line of tee-shirts, “Someone I love needs a Cure!”, “Wine a little HOPE a lot.”, and our new black with pink ribbons Tee, “Cancer Survivor”. 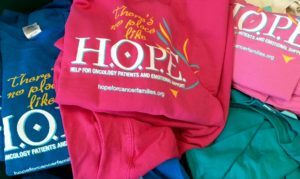 Our original tee-shirts (short and long sleeve) and sweatshirts.